Daily Dawn, April 3, 2002: "It looked something like an extraterrestrial event in a dusty, grassless, mud-made stadium, surrounded by smoke- emitting brick kilns. Even the sports-loving Greeks of the ancient times would have fared better than the Afghan refugees, who recently built this stadium without using any machinery. 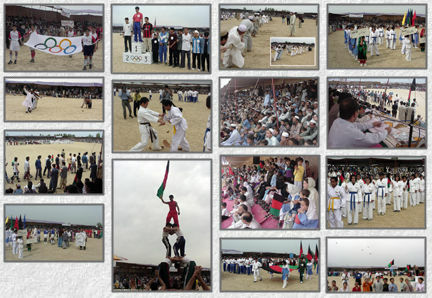 Yet the over 10,000 spectators, who thronged the Khewa Sports Stadium, were enjoying every moment of their Nauroz Sports Festival; clapping and whistling and yelling, undeterred by even a faulty sound system and frequent power breakdowns. The organizers had initially planned to hold the festival earlier but they had to put it off owing to Muharram. Also, a musical concert, which was to be held at the same venue, had to be cancelled. RAWA had earlier planned to hold the festival at the Qayyum Stadium, but the authorities refused to grant permission, citing security reasons. One thing was evident from the show; there was no division among the Afghans along ethnic lines. They were all Afghans, sharing their good moments with one another. Only if the Afghan leaders and commanders, who are solely responsible for driving the wedge amongst the Afghans, could learn from their people the lesson of peace."